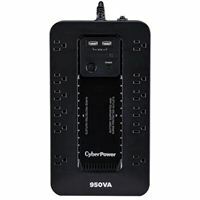 The CyberPower SX950U uninterruptible power supply (UPS) safeguards a home office PC and other electronics (monitors, printers, scanners, speakers, fax machines, CD/DVD players and iPods) from surges, spikes, sags, brownouts and other power abnormalities. Its composite integrated circuitry offers advanced lightning protection. A Three-Year Warranty ensures that this UPS has passed our highest quality standards in design, assembly, material or workmanship and further protection is offered by a $150,000 Connected Equipment Guarantee. 12.2" x 3.1" x 7"